How Affiliate Providers Are Paid? The Medallus Membership Program collects monthly membership fees from its members. The per visit Affiliate Provider fees are processed and distributed, less administrative fees, to the members of the Affiliate Provider Network on a monthly basis on or before the fourth Friday of the month following the visits made in the month of service. 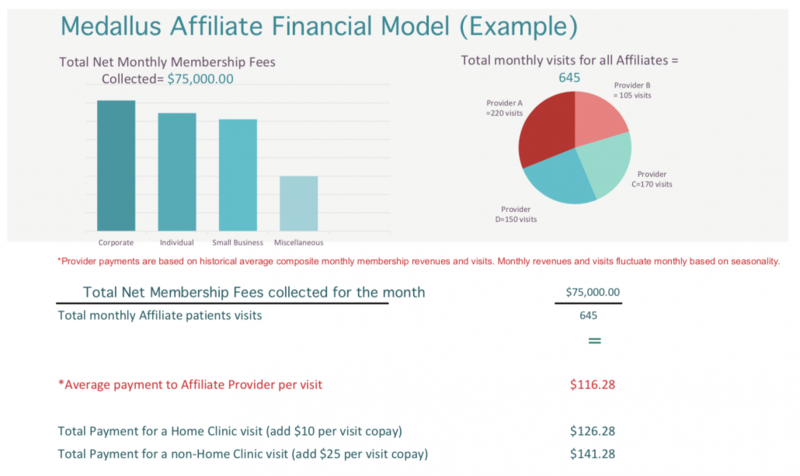 The following overview is an actual example of a net membership fees collected and providers per visit fees paid. Net membership fees are total fees collected less administrative fees. What is covered and not covered by the Medallus Membership Program. Non-Emergent Sick Visits- Strep, Flu, Upper Respiratory, Bronchitis, Pneumonia, Ear Infections, Sinus Infection, etc.